Front yards are typically used less for recreation than the back yard, so having a small one can be a blessing in terms of reduced need for maintenance. That being said, you still want it to look great--and be functional--which a bit of planning and design can help you achieve. The first choice to make is whether to include a lawn. 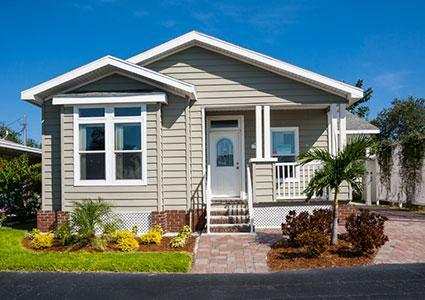 Large front yards beckon for a wide open lawn area, but with most small front yards it's a bit of a toss-up. A lawn gives a nice clean aesthetic, but will require weekly maintenance. Besides, there are many other groundcovers and ideas that reduce grass that can substitute nicely. For the smallest front yards -- say, 150 square feet or less -- it's better to forego a lawn if you want space for any other plants. Otherwise the yard may feel crowded. Hardscaping refers to the paths, patios, fences and all the non-plant elements of the landscape. In a small front yard, the key is to keep it simple and focus on the practical requirements for hardscaping. In a small front yard, there's generally not enough space to consider extensive hardscaping, such as patios, pergolas and major water features, though there are many small accessory items that can jazz up the space. A path to the front door is one element that no front yard can be without. There are two main options: a path that comes from the street, bisecting the yard, or one that comes from the driveway, taking a shorter route that goes parallel to the house. A path from the street is typically set at a right angle between the street and the house and gives a more formal, symmetrical look. A path from the driveway is an opportunity to use a curving, organic layout. 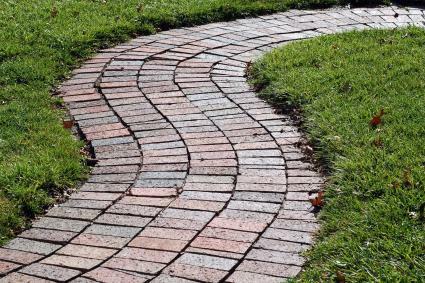 Any type of paving material may be used for the path, but for small front yards it should be under 3 feet wide, so it doesn't visually dominate the space. You may also want to add a path off the main path that leads into the side yard and backyard. This path should be smaller than the main path and made with another type of material to differentiate it as a secondary path--stepping stones are often used for this purpose. Getting from the front path to the front porch usually means a few steps are required--make these about 50 percent wider than the path to soften the transition from one to the other. You may also wish to include a small landing at the transition between the two which is simply a flange on the end of the pathway. If there is not an existing porch, it's a good idea to incorporate a landing in front of the door that can serve as a small patio for placing pots and other objects. These are optional in a small front yard, but they may be useful as a barrier between the street/sidewalk and the yard. If they are incorporated, keep them to 3 feet tall or less, so they are proportional. Leaving a thin strip for planting on the outside of a fence or wall, even just one foot wide, is a nice touch that softens the vertical form with foliage. Think small when it comes to plants for a small front yard. Large shade trees will feel out of place once they're full size, but there are several small flowering trees for use as a focal point. If the pathway layout is asymmetrical, use one flowering tree placed off center on the far side of the yard from the driveway. If the path runs from the street to the house and splits the yard into two symmetrical halves, put a matching tree in the center of each half, or leave it open for a sunnier yard. Avoid using shrubs more than 4 feet tall in a small front yard. It's also best to choose species that are compact and amenable to shearing, rather than shrubs that like to sprawl and spread. The key here is to avoid the temptation to mix too many species together, which will make a small front yard look busy and unkempt. Focus on a single groundcover if you want to cover a large area with something other than grass. Small ornamental grasses are a great choice for use as a groundcover in small front yards because they have a very neat and tidy appearance through the seasons. Stick with perennials that don't spread voraciously and stay below three feet in height when they flower. Accessories are part of what transforms a mundane front yard into a memorable one. Since most showy landscape features are too big for a small front yard, accessories are what will create visual interest. In addition to the items mentioned below consider wind chimes, small statues or other artistic features. Planters are often the best way to incorporate annual flowers in a small front yard. Use materials that match the house and/or the surrounding hardscape and place them around the front porch, landing and mailbox. 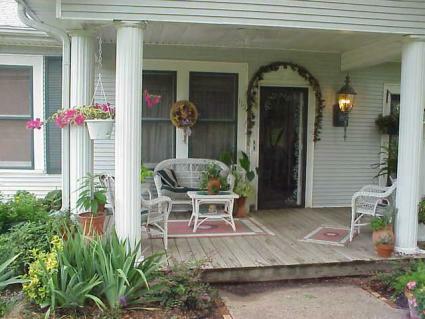 Hanging planters are a good choice for the eaves of a front porch. A single small boulder or a cluster of several boulders of varying sizes is an apt focal point for a small front yard and may be used together with, or in place of, a flowering tree or water feature. 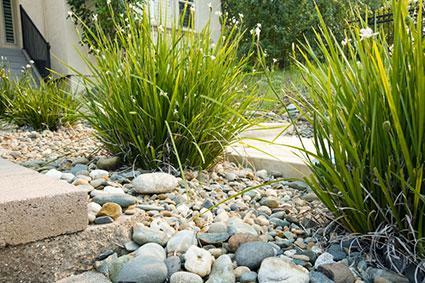 Small pebbles are an alternative type of groundcover that goes a long way towards keeping small landscape spaces uncluttered. They are also very low maintenance. A small reflecting pool with a fountain is about the only water feature that would reasonably fit in a small front yard. Use it as a focal point on one side of the yard in lieu of a flowering tree. However, you can also incorporate the water element with a bird bath, which is a great accessory to include as a focal point in a bed of perennial flowers. In a small front yard, arbors are typically only appropriate over the pathway where it connects to the driveway or sidewalk. 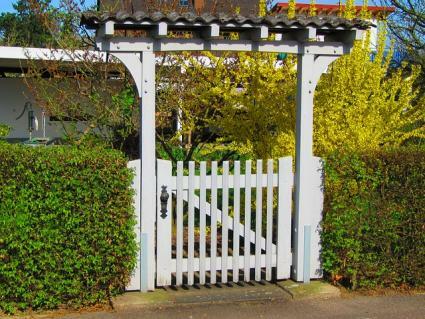 They are rarely used on their own, but are a good fit if a low fence or wall is used around the border of the yard--in this case, consider an arbor with a gate. Landscaping a small front yard may seem daunting at first, but breaking it down into logical steps makes it much more manageable. Layout the path(s) and install any fencing, walls or an arbor, if desired. Plant shrubs along the foundation of the house. Plant the far border away from the driveway with a low hedge or a perennial border (unless you want to leave it open to the neighbor's yard). Plant a narrow strip of groundcover or perennial flowers along the driveway (unless you want to leave these areas open for the lawn). Position any focal points, such as trees, water features, birdbaths, boulders, etc. There should be no more than two of these in a small yard. Plant a semi-circular bed of annual flowers around the mailbox (using planters, if desired). 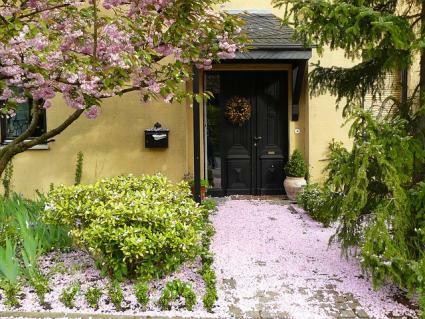 Add a small bed of perennial flowers on either side of the front door. Fill in the remaining space with a lawn or a low-growing groundcover. Add accessories in the yard and porch area according to your personal taste. 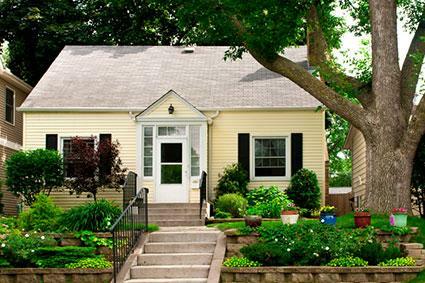 Small yards are appealing to homeowners because they have low maintenance requirements. To fully realize their potential, avoid packing too much into it and choose smaller plants and hardscape elements that are in proportion to the size of the space.